So-called tennis shoes and trainers — worn off the court — have rallied since the glaring American-in-Paris looks of the '80s. Inspired by a spread in Vogue last year, Jesse Garza, co-founder of Visual Therapy, the multicity styling service, lined up a look for a chic, on-the-go client consisting of a white T-shirt, a Jil Sander safari jacket and rolled-up pants with — in a first for him — Nike athletic shoes. "You want a tennis shoe, " Garza said. "The designers do them, but I'm not feeling it. I'm not feeling a designer tennis shoe. If you're going to wear a tennis shoe, wear a tennis shoe." Neutral-colored athletic shoes with a touch of neon or metallic "look cool and modernist, " Garza said. 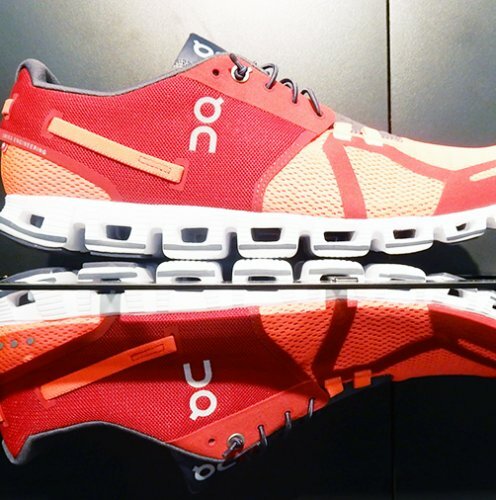 For lifestyle shoes, sneakers with a concealed wedge heel are becoming trendy, said Jim Whitlow, owner of Deka high-end activewear stores in Atlanta and Chicago. "You're not going to run in them because they're wedges, but you can definitely go to the gym in them. They have a wedge built in to give some height." "They can take a person from gym to carpool to happy hour to airplane, " said Whitlow, formerly a competitive runner and a father of four, always on the go. Newtons take some getting used to for a casual runner used to heel-striking. Newtons are oriented to encourage a midfoot landing, in line with the natural-form running trend. Rather than being elevated, my heel seems about level with the ball of my foot, which feels as if it has a roller under it to spring off of.